Randolph: Nothing out of the ordinary here for the Bray man. While Georgia did have quite a few shots, he wasn’t actually troubled all that much, one sloppy fumble aside, which lead to a corner. Saying that, he probably wasn’t getting to Kankava’s superb 84th minute post-clipper that scared the bejaysus out of us all. Coleman: Superb performance from our skipper. As with many of the players, provided great composure in possession, combined very well with Hendrick + Whelan and provided great thrust down the right hand side. Was almost like another midfielder at times. Untroubled at the back, as you’d expect. Best game in a green shirt since having his leg snapped in two. Delightful to see him in this form. Duffy and Keogh: While Georgia did play through our midfield at times, they didn’t trouble our back four. Ensuring a high line was kept, the two lads did all the stuff you’d expect of them, winning headers, anticipating and clearing danger and kept Georgia’s front players under wraps. What was noticeably different was their composure on the ball. Duffy still launched too many long balls (his Beckanbauer complex) but Keogh, who is generally poor on the ball, was far more composed than usual, played a wonderful pass out to Hourihane in the second half whilst under pressure. It does matter. Great leadership from both and Keogh justifying Mick’s decision to pick him ahead of Egan. Stevens: Had a less involved game than his back four comrades but after a handful of Nations League games, he now definitely looks the part of an international left back. Wasn’t troubled and generally constructive on the ball. Whelan: Superb performances. Did all the things he was always meant to do but didn’t always do in an Ireland jersey. Provided stability at the base of midfield, anticipated attacks, intercepted balls, offered himself as an outlet. He had much better passing options than he usually does but he kept thing moving and moving quickly. Where has this Glenn Whelan been all of our lives! Hendrick: Who is this man?! Has he finally emerged from the coma he slipped into after Euro 2016?? Just unrecognisable from the man wearing the no 13 for the past 2.5 years. From the first minute he was looking for the ball, dropping his shoulder, swiveling and playing ballsy passes again. Really seemed to have his pep back, driving forward, winning tackles and just enjoying himself. Hourihane: Hard to say anything definitive about Saturday but last night was the first time he actually looked like an international footballer. Before this campaign he really hadn’t. A huge performance by, and for, him. Will help him greatly and he brought so much to the team last night. Covered a lot of ground, and with Hendrick really helped pressurise and disrupt the Georgian midfield. Collectively, they set the tone. On the ball gave so much, we know about his delivery but it was his medium range passing that was so impressive last night. It sounds simple but we haven’t had midfielders who can play quick, accurate 15-20m passes in a forward direction to a teammate in the past few years. He was great at releasing runners. It was clear after about 10 mins that Brady wasn’t “in-tune” technique-wise and luckily Hourihane took over the set-plays. Superb free-kick and a performance that will give him great confidence to really launch his international career now and he showed he is well capable at this level. Brady: Got the nod ahead of Doherty last night but sadly it didn’t really work either. Just doesn’t seem sharp or confident at the moment. Really needs game time at club level. While Coleman attacked very well down the right, Brady didn’t seem to understand how to interact with him and how to attack from outside-in. In fairness, he probably did allow Coleman more space to attack into. But overall, seemed a bit lost and his delivery was poor. McGoldrick: Wow. Just wow. Another man who clearly benefited from having the full belief of a manager (and having a good season in a good club team doesn’t hurt obviously) but McGoldrick gave an absolutely fantastic performance in how to lead the line. Not a pacey guy but was out in front of his man and won all the ball played in front of him. His touch was impeccable, very comfortable with defender on his back to buy time and lay it to a great array of forward runners. When was the last time we’ve had an out-ball like this? Ok probably getting carried away with things here, but Duffer in 2002??! He made everything look simple (ok maybe not shooting…) last night and who would have thought he’d been getting a standing ovation for a non-scoring performance against bloody Georgia?! Fully deserved, as was his MOTM award. 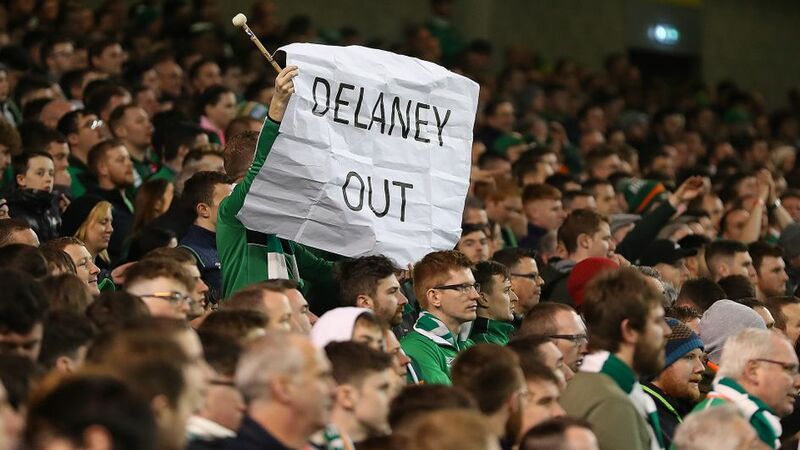 McClean: We got the full gamut of the James McClean portfolio last night. Started poorly, with a stupid booking for a needless foul in a dangerous area and didn’t look up to the level, but grew into the game in the second half and made some of his typical driving runs which helped put us on the front foot. However, he hasn’t, and probably will never, learned when the right time to lay the ball off is. Put in lots of what looked like threatening crosses that never actually got to a man. His energy was positive, no question but at this stage Callum O’Dowda is just a level above him. Subs: O’Brien hustled well but probably not on long enough to comment. However Doherty was impressive in his cameo and while the idea of playing him advanced of Coleman is flawed, his 10 mins on the pitch probably yielded more than Brady’s 74. Wouldn’t rule him out at RM yet Mick. Mick: will be very pleased with last night’s performance. Ok, all the above seems like we are getting far too carried away with a victory over a team ranked so far below us that pretty much equalled us in all statistic measures last night. But we drew with them last time round and 5 of our previous 6 games had been by 1 goal margins, most of which have been very hard won or even undeserved. Georgia have outplayed us on a number of occasions, and while they had 51% of possession last night and did create chances, we really were better than them and should have won by more. There were very positive performances throughout the team but really the triangle of McGoldrick, Hourihane and this fella wearing no. 13 was so refreshing to see. All 3 were constantly available for the ball, able to hold it under-pressure and deliver it to a team-mate. Sounds basic but this basic tenet of possession football has been sorely lacking since Wes exited the stage. Now, of course it is not a new phenomenon in football where a new manger walks into a dressing room and provides the players with an immediate lift and knocks a tune out of guys who’d previously been hitting absolute dud notes and absolutely, the fixture list has been very kind to us with these two to begin with. But what was impressive about last night was the body language and energy of the players. Positive, expressive and not carrying the weight of the world on their shoulders. Have to give Mick a lot of credit for setting the tone in the dressing room which created this. Denmark away is most definitely a significant step-up in standard and we’ll get a much better picture of where this team is at after Copenhagen but last night (forget Saturday) was a bloody good start. While this was a positive start on the pitch, let’s hope the changes off the pitch in the past few weeks, and last night’s protest, are only the beginning.